Technisat has a reputation for producing quality satellite products including PC tuners (notably the Skystar range) but is perhaps not so well known in the UK for its digital terrestrial offerings. 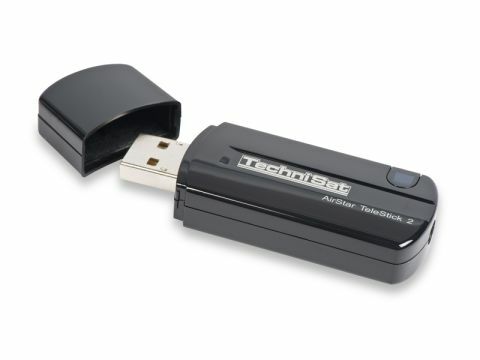 The Airstar Telestick 2 is a USB tuner stick suitable for standard-definition Freeview reception on a PC. Roughly the same size as the average disposable lighter, it comes with a fly lead for plugging in an aerial. A sizeable portable antenna is provided, or you can connect it to a rooftop aerial instead. The remote is disappointingly basic and obviously intended to be used with Technisat products aimed at the German market. There are buttons for the SiehFern Info service – of no use here – and one marked Hilfe – Geman for help. Oddly, it doesn't have buttons for the PVR functions included in Media Center and DVB viewer. The stick is compatible with Windows 7's version of Media Center (it'll work with Vista and XP too) whose support for MHEG-5 interactive services has allowed Technisat to include the Freeview logo on the box. Alternatively, you can use Technisat's own DVB-PC Stars software bundle comprising DVB Viewer TE2 edition and Eve editing software. The former will be familiar to owners of Technisat satellite products and requires you pick your local terrestrial source from a list. Located channels aren't automatically listed in standard EPG order but you can reorganise the resulting list by name, category and number, rename or delete channels and create a favourites list. The main DVB Viewer application is mainly grey with a row of red buttons running underneath the currently showing programme covering all major functions including the PVR and EPG access. Channels can be displayed listed on the right together with the channel logo and the name of what's currently showing and you can have now and next information showing displayed under the current programme. The full EPG can be displayed in two ways. One option is a basic grid with channels listed down the left and programmes down the right. The alternative is a more Media Center-esque Timeline view, showing five channels onscreen at a time with a red line showing where you are in the schedule EPG data can also be exported to your hard disc and viewed as an HTML file and you can schedule recordings by selecting programmes in the guide (there's also a manual timer). You can choose where to put recordings or timeshifted material (stored as a transferable temp file) set a buffer either side of recordings and opt to automatically split files in advance if you want to burn them to disc. Files are recorded in native MPEG-2 transport format (playable using Windows Media Player and others) and there's no provision for post converting them to other formats. Version 2 of MainConcept's Eve software is thrown in for basic editing purposes, however. Both tuner and DVB viewer proved solid all round in operation. The antenna was very eff ective at pulling in Freeview channels in our central London test area. Scheduling recording using both Media Center and DVB Viewer is easy to master and glitch free with recording quality being as good as the source – localised aerial conditions permitting of course.